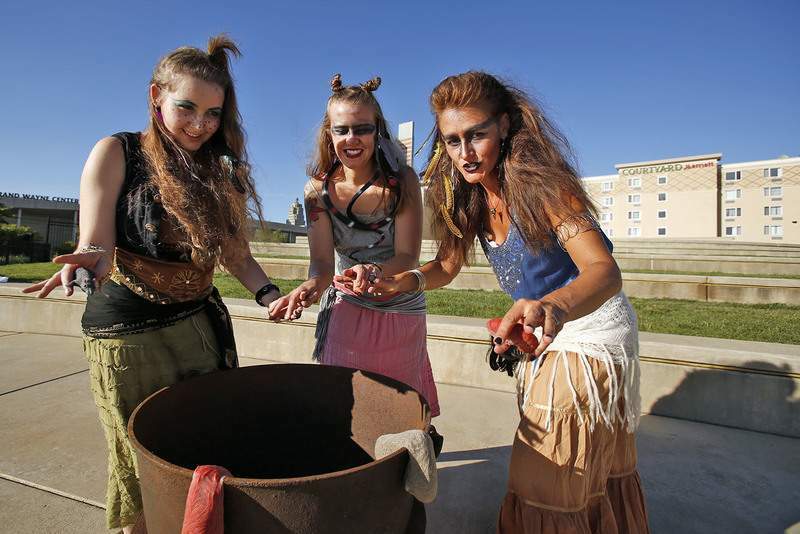 Chad Ryan | The Journal Gazette Playing witches in "Macbeth" by Shakespeare From the Heart, Megan Speith, left, Anastasia Beesley, center, and Bethany Schmitt drop items into their cauldron during a dress rehearsal on Wednesday at Parkview Field. 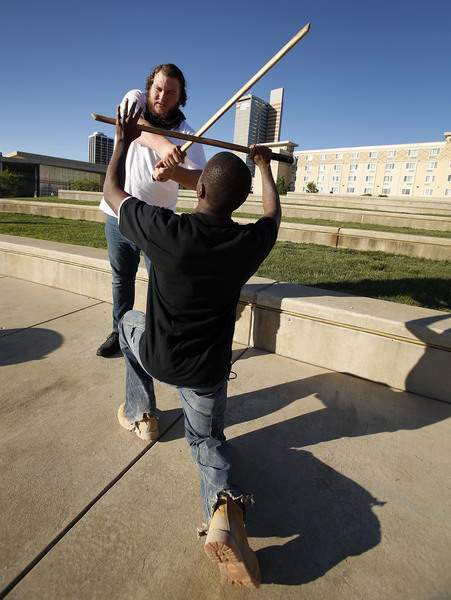 Chad Ryan | The Journal Gazette Andrew Scantlin as Mac Duff, left, and Cortney White as Macbeth practice a battle scene during a dress rehearsal of "Macbeth" by Shakespeare From the Heart on Wednesday at Parkview Field. 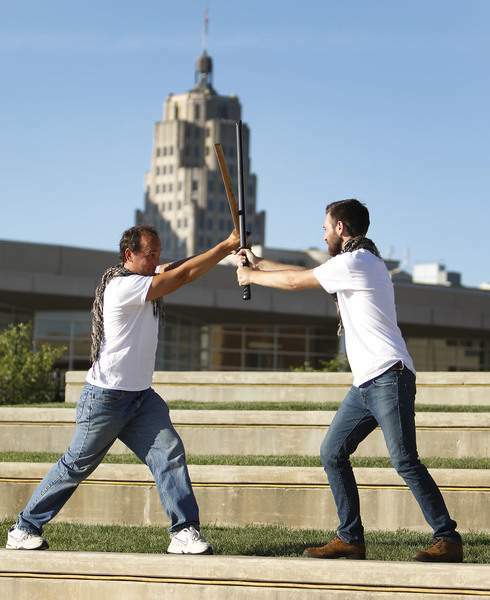 Chad Ryan | The Journal Gazette Bob Ahlersmeyer, left, as Banquo and Tyler Adelsperger as Ross stand with swords locked on one another during a dress rehearsal of "Macbeth" by Shakespeare From the Heart on Wednesday at Parkview Field. 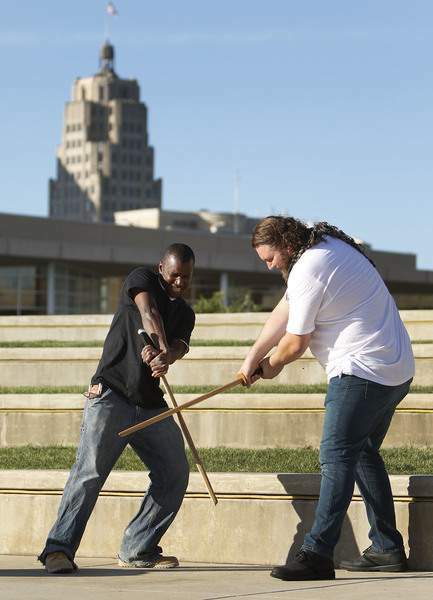 Chad Ryan | The Journal Gazette Cortney White, left, as Macbeth and Andrew Scantlin as Mac Duff practice a battle scene during a dress rehearsal of "Macbeth" by Shakespeare From the Heart on Wednesday at Parkview Field. Local organization Shakespeare from the Heart is known for transforming public areas into Shakespearean theaters that are free to the public. 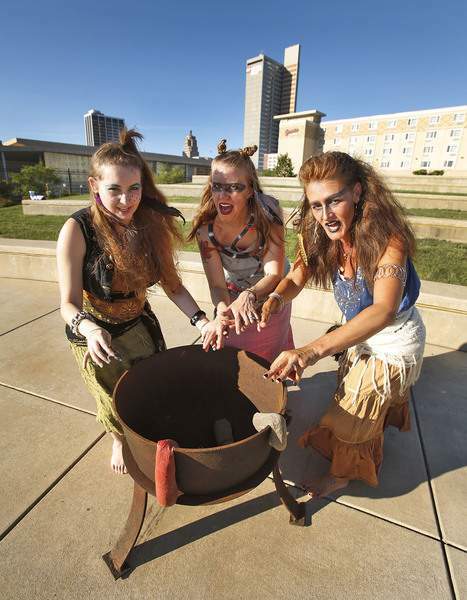 But this year, the stakes are raised as the company stages "Macbeth" at the amphitheater area at Parkview Field. The show opens Friday. Freewill donations will support Fort Wayne Dance Collective, which have helped with the choreography for the play. We asked director Nol Beckley a series of questions by email to learn more about why he selected Parkview Field and how "Macbeth" may have more in common with shows on your binge watch list than you thought. Shakespeare from the Heart has typically staged its productions in local parks. Why did you want to use the amphitheater at Parkview Field as a venue? Beckley: About a year ago, I was scouting for locations around the city and wanted to find a place centrally located and with a higher profile than anything SFTH has ever done. A friend and I were at a TinCaps game and loved the feel of the park. We stood on the amphitheater and started to picture the production in our heads. The visuals of the park or the city in the background were unbeatable. How does the venue work for "Macbeth"? Beckley: Parkview Field is about entertaining people and Shakespeare wrote for the people. His stories resonate with universal human truths everyone can identify with. You don't need to be a scholar to understand revenge or ambition or love. What is it about "Macbeth" that remains relevant to modern audiences? Beckley: Macbeth begins the story rather heroically, loyally defending Scotland against domestic and foreign enemies. He defeats both foes and gains the respect of the king, the nobility and the people. His ambition leads to his fall from grace. Many of our modern day heroes have taken similar falls: Lance Armstrong, OJ Simpson, David Petraeus, Pete Rose, etc. Politically, Macbeth operates in a ruthless world. He makes decisions which haunt him. He makes mistakes that directly lead to his political and mortal downfall. This show features fight choreography by Scott Hess and dance choreography by Fort Wayne Dance Collective. How does choreography impact the production? What's tougher to learn, dance or fight choreography? Beckley: Scott's choreography is one of the finest things about our production. He's fantastic. In the play, we have to kill and wound several people. The trick is to not hurt them in that process and Scott is a master of that. When we first spoke, I only had a general idea of what I wanted and he was able to make that idea come alive. The dancers add an artistic element to our production. They play the Battle of Cawdor and one of Macbeth's hallucinations. Their graceful movements stunned me when I first saw what they were able to create. Dance and fight choreography are similar. Everyone works toward creating a show of which they can be proud. Both the dancers and the fighters have spent a good deal time honing their craft, and it's impossible to say which is tougher. Why did the organization want to support Fort Wayne Dance Collective with freewill donations? Beckley: The charity was suggested by a member and was voted on by members. Each year for our show, we vote on the charity we will donate the proceeds to the show. They have been fantastic to work with and their talent is apparent. What's the importance in keeping these Shakespearean productions free to the public? Beckley: It's never been about making money. We are all volunteers and we love to perform. Shakespeare's plays are in our DNA whether we recognize it or not. From "House of Cards" ("Macbeth") and "Sons of Anarchy" ("Hamlet") to "Game of Thrones" ("Titus Andronicus," "Richard III") and "Empire" ("King Lear"). It's great to go over the source material for these works that hold today's zeitgeist.